The 4 piece Minky Dot Chenille Toddler set is made of playful, plush polka dots. This set is so soft and elegant it is a must have for your toddler’s room. Our Minky Dot Chenille is so incredibly soft that it melts in your hand. One Toddler Bed Comforter, one pillow sham, one 100% cotton jersey top sheet and one 100% cotton jersey fitted sheet. The 100% Cotton Percale 4-piece toddler bedding set is a perfect match for your toddler’s room. Creative color combinations made of high quality cotton make these toddler bedding sets ideal any toddler’s room. Set includes: one comforter (fitted on one end) for a better fit. One top sheet fitted on one end with elastic and one fitted bottom sheet plus a standard pillow sham. 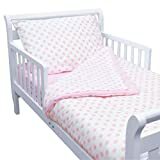 Fits all standard size crib mattresses (28″ x 52″.) Machine wash cold with like colors, tumble dry low for best results.